She has always been temperamental with her behaviour though. Hence, she wears the ear muffs and also in NSW she is treated with regumate. Which is a massive assistance to feisty mares and keeping them calm. Couldn’t use that particular product when she was in Melbourne because it’s banned. Waller said in an interview that the rug was pinching her and he had to get it off. See Group 1 Gav ( Eades ) bought that gate panel for around 9 thousand $. That's about right imo, blaming the muffs coming off was a "throw", taking that rug of her the way he did in the yard sent the message "action Jackson" and she responded in kind..
Well you probably know far more than me about cranky horses but I'm sticking to my theory. What has she done in her racing career Tlaz. to suggest she has as you call it " a foul temper". At last some Normality . Fark ..... If she isn't the best of all times I'll eat my egg sandwich. * Jameka is rated close to Winx at Jamekas and Winxs? * you don't think winx has much on Jameka. May I ask then where you put Jameka on a global scale before I start having a go at what you're saying. I've been away for three days and your still all at it! Each era has a champion. Winx now. 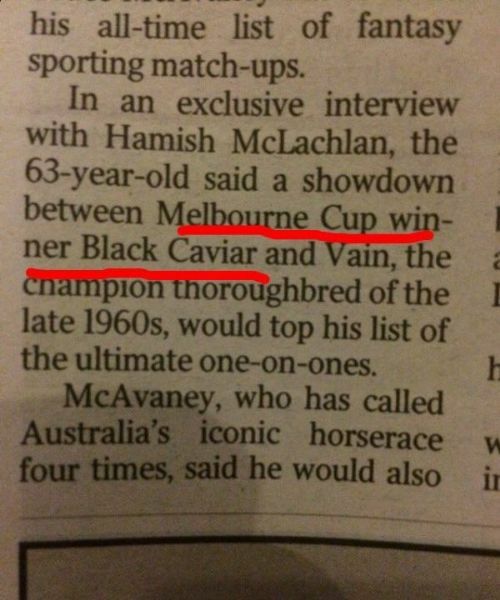 Black Caviar then. Makybe Dive in her day etc etc etc. Loved Jameka also another wonderful mare. They are all totally different animals. This is about Winx but alot of the bad reviews are due to perceived downgrading of other horses. I would never bad mouth any of the above mares. Or many others which have been champions or favourites in the past. Life has been better because they gave their all. But I've never seen a racehorse like Winx before. So she gets my acclaim today. I don't know what you have been watching in recent years. But you missed plenty of fun and games with this girl. Diving through holes. Missing the start. Being snookered but getting out in time - just. Being left flat footed but finishing faster than she ever had to before and getting the win. Skipping over mud like it was solid ground while all around her got bogged down. Running race records when the tracks were fast. Finishing better than any sprinter on the same card or any other horse for that matter. So to downgrade her you are saying there has been nothing worthy of note racing in Australia for four generations. And for that matter as she broke plenty of race records not much before either! I've just had three wonderful days with the family. You are still trying to convince others that she was overrated. Have some family time and let it go. We love her for a reason. Maybe you don't see it. But it's time to give it a break. "Both Danny Shum Chap-shing and Jimmy Ting Koon-ho have admitted they avoided taking horses to the 1,000m Class Three at Sha Tin on Easter weekend, which Voyage Warrior won with ease in just 54.89 seconds. Shum’s Golden Dash and Ting’s Yee Cheong Baby will instead run in Wednesday night’s Class Three Seoul Handicap (1,000m) at Happy Valley." Was only his 2nd start. I think everything has been said that needs to be & your post furious is a wonderful tribute to close this thread on.